Spilling oil on the driveway can end up leaving an unsightly stain that can quickly become an eyesore. Not only that, but oil stains are typically tough to remove. There doesn’t seem to be any amount of scrubbing or pressure washing that can eliminate the stain. Fortunately, these stubborn stains can be lifted. With a little time and patience, learn how to remove oil stains from the driveway. If your car is leaking oil, or you have an accident while changing your oil, it can result in the dreaded black spot in your garage or on your driveway that doesn’t seem to want to give up its grip on the concrete. Several different cleaning techniques use simple, everyday items that will eat away the oil on your driveway without leaving a toxic residue. There are many different ways to remove oil from a driveway, depending on the kind of driveway you have. For smaller stains, you can start by cleaning the affected area with baking soda and hot water. Fortunately, even the stubbornest of stains can be lifted with the following methods. You no longer have to worry about spilling motor oil on your asphalt driveway. With a few simple ingredients that you probably already have in your kitchen, you can quickly remove the stains and return your driveway to its pristine condition. Allow the litter to stand overnight. The following day, sweep up the litter and hose off the area. Next, squirt a small amount of dish soap on the remaining oil stain and scrub it with a stiff scrub brush. Rinse away the suds with warm water. Unfortunately, because of the porous nature of pavers, you may not be able to obliterate the stain. First, cover the oil stain with the sawdust. Allow it to remain on the oil stain overnight. The next morning, remove the sawdust from the driveway with a broom and dustpan. Next, pour the liquid dish soap directly onto the stained area. Pour hot water into a bucket. Dip a stiff brush into the bucket of water and scrub at the stain. Rinse the area with hot water to remove the dish soap residue. If the stain hasn’t been completely removed, pour the powdered laundry detergent onto the stain and add ¼ cup hot water to form a thick paste. Scrub the area with the scrub brush and leave on overnight. The next morning, rinse the area with warm water. Repeat the process until the stain has disappeared. Oil stains on concrete driveway can be challenging to avoid, no matter how hard you try. There are several methods for getting rid of oil stains, but the right approach will be determined by how massive the oil spill is and how long it has sat. The best way to remove oil stains from the driveway is with kitty litter if the spill is fresh. Just pour the kitty litter over the stain and allow it to absorb the spill. After about an hour, you can sweep up the mess. If the kitty litter isn’t successful in removing oil stains from a concrete driveway, you can use liquid dish detergent or a baking soda bath to remove the stain. First, soak the stain with water. Then sprinkle an ample amount of baking soda or dish detergent onto the stain. Allow it to sit for 30 minutes. Meanwhile, boil a large pot of water. Pour the boiling water over the surface of the baking soda or dish soap and scrub the area with a stiff-bristled brush. Rinse off the residue and repeat the process if needed. Sidenote: If you come across rust stains on your concrete driveway, make sure you check out our tips to remove rust from a driveway. A detailed guide on rust removing from concrete. Oil stains can be effectively removed from aggregate driveways if it can be dealt with before the oil seeps into the gravel and crushed stone. If the oil is still moist, you can use this method to remove any stain that the oil leaves. Mix the box of baking soda with a cup of the fine grain kitty litter. Blend it well, then slowly pour it over the surface of the spill. Avoid blotting the area before you apply the mix to limit the risk of pushing the oil further into the driveway material. Leave the mixture on the oil for at least two hours. After most of the oil has been absorbed into the mixture, use a hose to spray it off. Next, add a few drops of the liquid soap to the gallon of warm water. Slowly pour the water over the area. Using a wire brush, scrub the area using light circular motions. Continue adding water and scrubbing until the water is gone. Spray the area with a hose to remove any residue. Blot the area gently with rags. 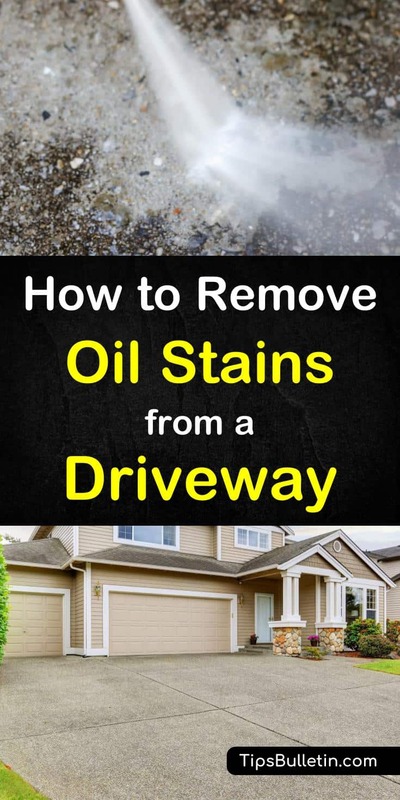 Now that you understand how to remove oil stains from your driveway, you can rest easy that if your car is leaking or you happen to spill some oil during an oil change, that your driveway won’t be permanently stained. With a few simple and inexpensive ingredients and a little bit of work, you can successfully remove any oil stain that is marring the look of your driveway. We hope you enjoyed the information in this article. 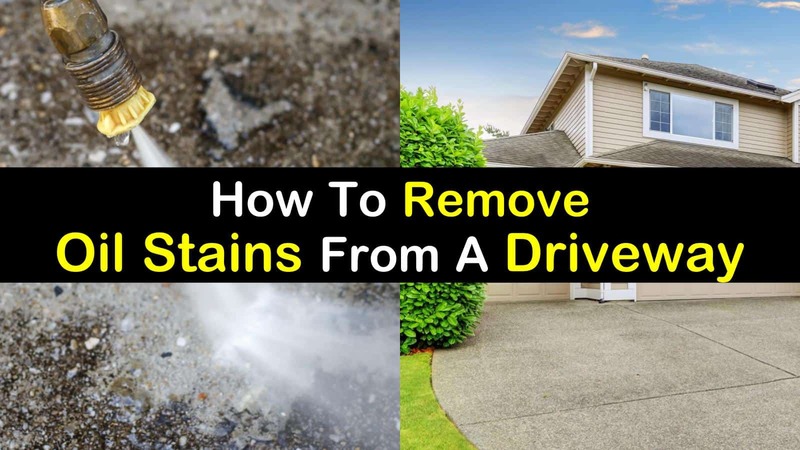 If you found the info about removing oil stains from a concrete driveway, we hope that you’ll share the article with all your family and friends.